I'm taking part in a really fun competition at the moment with Bright Light PR and fashion brand Damsel in Dress. LFF has been selected along with 4 fabulous bloggers to take part in a 'Blogger style-off'. So what does a style-off involve? Bright Light asked us to pick a dress from the SS13 Damsel collection, style it and take a photo to share on the brand's Facebook page. And that's where the competition begins! The photos are up there now and FB users are encouraged to vote for their favourite look. The winner will receive a £250 voucher to spend with Damsel in Dress and if LFF takes the prize I'll be running a competition to give this away to one lucky reader. So I'd like to appeal to you to vote for me by clicking here, and liking my look (picture 5). I picked the beautiful Calla Lilly dress because I wanted something practical that would look good for everyday wear and I liked the east-meets-west feel with the delicate lilly print. I feel really lucky to be the owner of such a lovely dress, it's brilliant quality and has a stretch material panel on the back that makes it super-comfy. 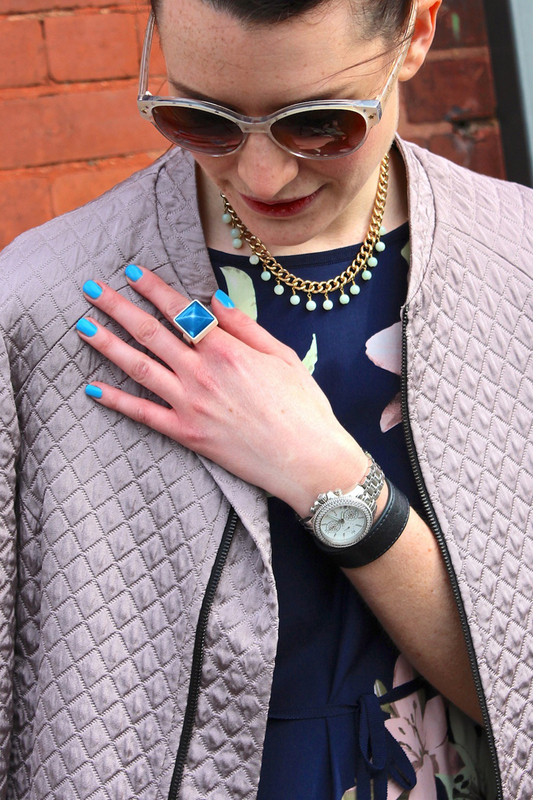 To style it, I played on the Oriental feel and paired it with a 100% silk quilted Topshop bomber jacket. Then I pulled the look together with a bunch of my favourite accessories- including my Cinderela B Pom-pom necklace, Marc by Marc Jacobs sunglasses and ring [the awesome colour-pop blue nail polish is Barry M]. I already voted for you! Mainly because um.. you actually styled the dress and didn't just wear it. Thanks for the cred Soph - and I totally agree with Sarah.